Earth moving machinery at work this week preparing the site for construction of the proposed gambling hall in Aquinnah. The Wampanoag Tribe of Gay Head (Aquinnah) has begun construction of a high-stakes bingo hall on tribal lands at the westernmost end of the island of Martha’s Vineyard. Within the tribe, many are questioning the move. Tribal leaders see the bingo hall as an opportunity for economic development. Long-time Wampanoag residents of the town, formerly known as Gay Head for its gaily colored cliffs, are concerned about how gaming will affect their tight-knit community. June Manning, a tribal genealogist and well respected community volunteer, said repeated tribal votes in favor of constructing a bingo hall on tribal lands did not reflect the sentiment of local residents. “It’s not something we really want in this community. This would’ve been better off in Bristol County,” she said. Referring to the tribe’s out-of-town political base, she said Aquinnah residents are now a minority within the tribe. “Those of us who reside here, of which there are about one hundred of us, are outnumbered by the people who voted for this, who reside down-Island and off-Island,” she said. Driving to Aquinnah in late February, past meadows, stone walls and an expansive view of Menemsha Pond, it is difficult to envision a ten-thousand-square-foot dome housing 250 electronic gaming machines rising out of the landscape. But on a cold, windy day, heavy equipment operators were hard at work clearing land for the project. The facility will reportedly be built using a fabric skin over an aluminum frame, which allows for quick construction. Plans call for a beer-and-wine bar, outdoor seating area, and mobile food vendor area. Tribal member and Aquinnah town administrator Jeffrey Madison was born and raised in Aquinnah. A lawyer, former longtime selectman and economic development director for the tribe in the 1990s, Madison said there is little support for the project among those who still call Aquinnah home. Madison, whose father was chief medicine man for the tribe, a position his grandfather also held, said support for a gaming facility is based on the mainland among tribal members who don’t have any connection to Aquinnah. “They see this as a way for a quick buck,” he said. 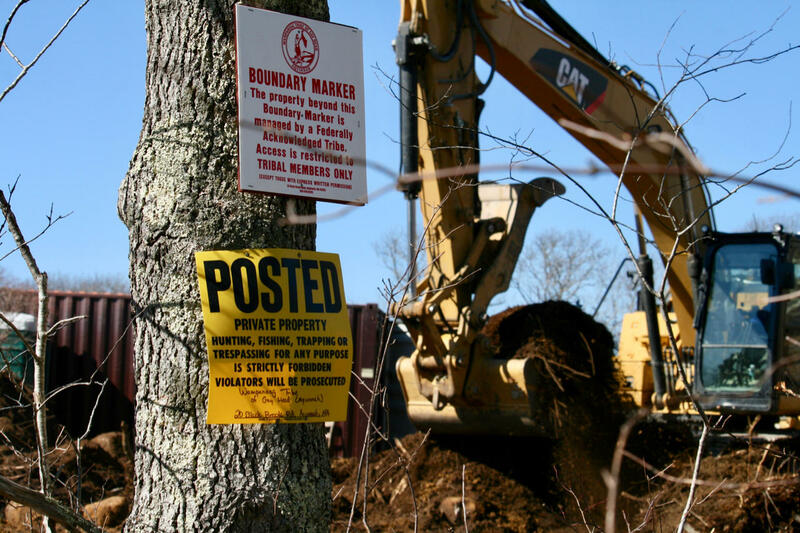 Although large Island development projects are subject to detailed and time consuming review at the local and regional level, Chairman Maltais said the town and the Martha’s Vineyard Commission have no jurisdiction over the project. In a letter to the Aquinnah selectmen, Maltais promised aggressive legal action and a severing of relations if the town attempts to interfere. Madison said he does not know how the introduction of high stakes gaming will change the town he has known all his life. Manning said island visitors do not come to the Vineyard to gamble. The project, identified as the Aquinnah Cliffs Casino under a heading of "job opportunities" on the tribe’s website, is expected to be completed in six months, the tribe said. In the past few weeks, the Steamship Authority has struggled to maintain ferry service to Martha’s Vineyard. Its two large boats have suffered repeated mechanical issues, while another large ferry was undergoing a winter overhaul. A fast ferry was brought in to provide service in the meantime—and it’s gotten plenty of attention from ferry riders. Oh, the snow and the wind are real, but the word is not. Deer hunting season is open across the state. On Martha's Vineyard, thanks to a unique three-way partnership, hunters aren't the only ones showing up with expectations at the island's weigh-in station. This season marks the 140th for the Flying Horses, the oldest operating carousel in the country, and a major attraction in Oak Bluffs, Martha's Vineyard. The carousel has a special feature that has mesmerized generations of riders: a ring-dispensing arm. As riders go around, they reach out their hands in the hope of catching the legendary "brass ring" and thereby winning a free ride.